With the advent of Intel’s 8th Generation of processors, Asus leaps ahead of the curve with the announcement of their upcoming models beginning the second quarter of 2018. That right there in George’s hands is the Zephyrus M – a new and well improved version of the Zephyrus with a bigger battery, even more elevation than its predecessor for better cooling, and of course – even more power inside its unbelievably small frame. The top model, still the Zephyrus will ship with 24 Gigs of RAM! Let that sink in for a moment. Right underneath it is the FX line and the arrow on the left shows the price bracketing – ROGs standing at the very top of the tower. Now there’s a lot of technicality as to why it is in this order but the simplest explanation still stands – the higher, the better. These new units will soon be in stores and will share the shelves with its current roster of 7th generation devices for a period of time. Read on the PR below for the full details and the prices for their upcoming units. 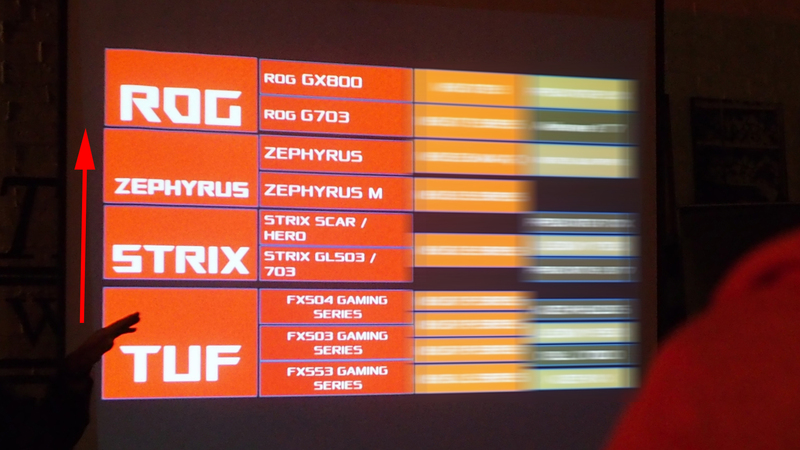 ROG Strix Series and the All-New ROG Zephyrus M and TUF Gaming Series. 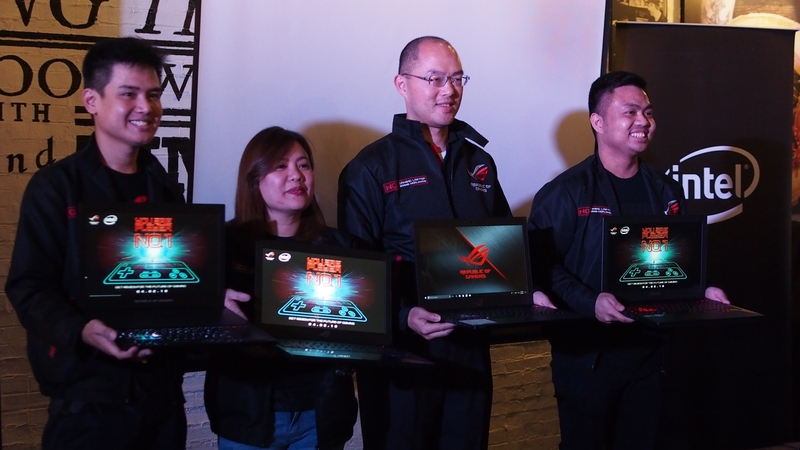 Manila, Philippines – April 3, 2018 – ASUS Republic of Gamers (ROG) in a closed event today unveiled an 8th generation Intel Core Processor refresh for its entire line up featuring Quad and Hexa-Core processors paired 120hz and 144hz across the entire range. The 8th generation Core i5-8300H now features 8 threads, compared to its 7th generation i5-7300HQ which did not feature hyper threading. The 8th Generation Core i7 processor, meanwhile, get its core count boosted to 6 cores and it’s thread count to 12 for a performance boost of over 23%, in the form of the I7-8850H. Lastly, a new Core i9-8950HK Mobile Processor was also announced with a staggering 4.8 ghz single core boost speed and 12MB of L3 Cache for those who want unlimited mobile power in their devices. The Core i9-8950HK was featured inside the New Chimera G703 in Intel’s worldwide launch. 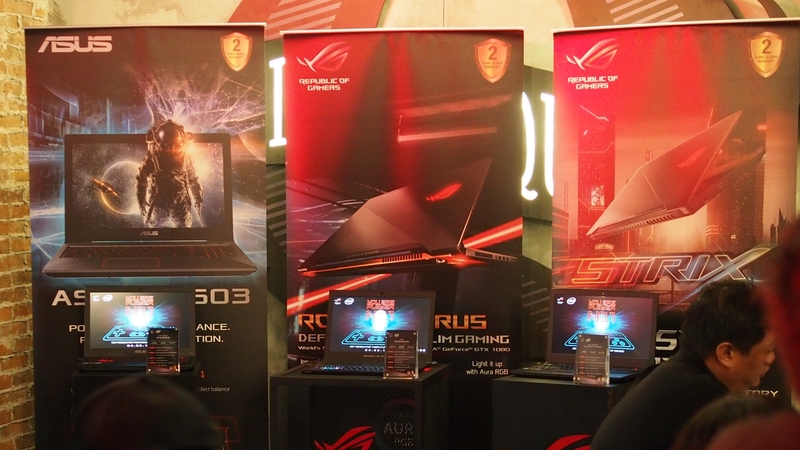 In terms of product range, ASUS announced a new ROG Zephyrus M laptop alongside the new Asus TUF Gaming FX series. 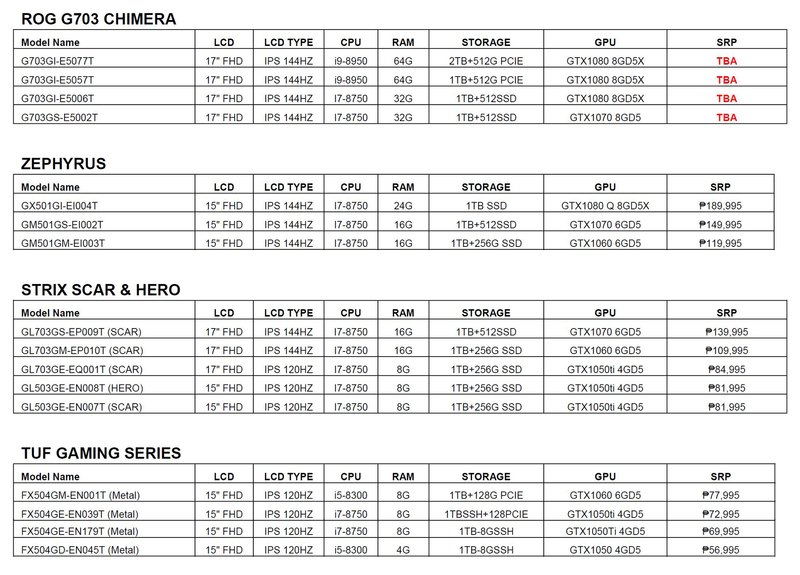 Meanwhile, the Chimera G703, Zephyrus GX501 and Strix GL503/GL703 gain performance upgrades to both compute power, display output, ROG gaming software and Aura Sync Compatibilities. 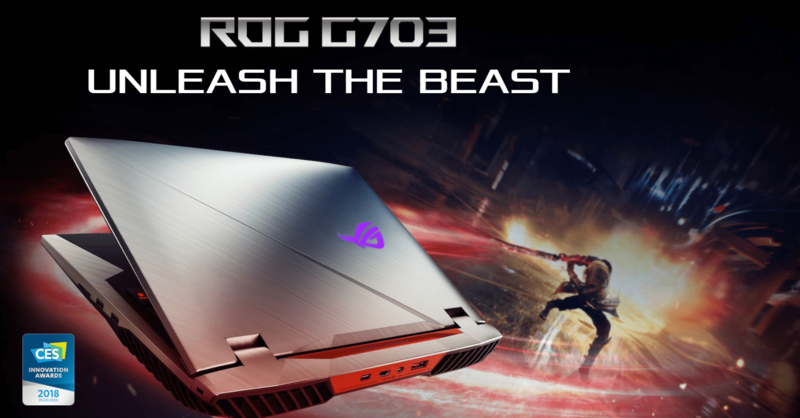 The New ROG Chimera G703 features the same most-loved bio-armor design with quad-vents as originally launched in 2017 but now feature more cores and more compute power. The G703 can be configured with up to a Core i9-8950HK processor, 64GB of ram, 2TB of HDD coupled with 512GB of PCIEx4 NVME SSD and a discrete Nvidia Geforce GTX1080 with 8GB DDR5X ram. Further, the G703 is still the world’s first gaming laptop to feature 144Hz refresh rate, paired with a 100% sRGB IPS Panel and G-sync. On the keyboard side, each individually backlit key now features ASUS RGB Aura Sync so you can sync it with other products from the company which are compatible with the Aura SDK. Other upgrades include a new 12V fan for higher fan speed and 45% better airflow, matched with thicker fins for better air flow resistance. Proven since last year, the ROG Zephyrus is a revolutionary gaming laptop born from ROG’s persistent dedication to innovation. Despite being thinner than all previous ROG laptops, it has the hardware to rival high-end gaming desktops. 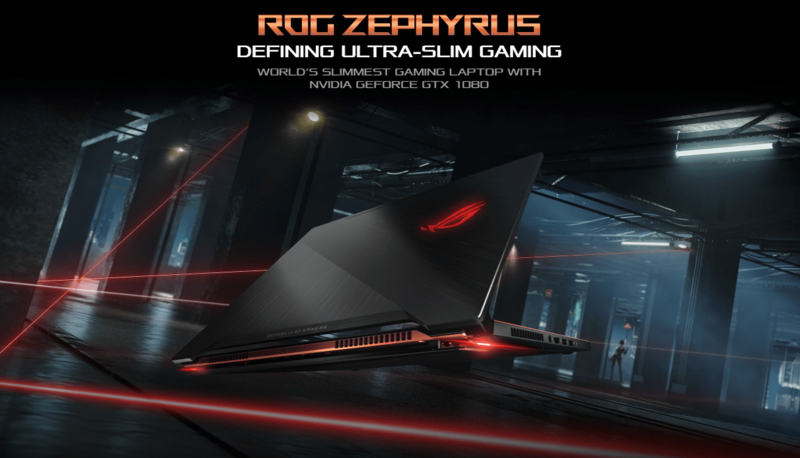 The New ROG Zephyrus GX501 is still the world’s thinnest gaming laptop with a GTX1080 and more. Featuring the ROG Aerodynamic Active System (AAS), the GX501 is able to maintain the power of Intel’s most powerful CPUs and a discrete GTX1080 under great temperatures. This year, ROG takes the GX501 a step further by harnessing the power of Intel’s Hexa-Core Core i7-8850H and upgrades the display to an ultra-fast 144 Hz refresh rate IPS panel with G-sync. It’s the world’s most powerful Ultrabook. New to the GX501 this year is the AURA Sync capability and a 1TB PCIEx4 NVME SSD option. Building from the success of the GX501, the new Zephyrus M GM501 series is variated on several key aspects including the centrally placed RGB Keyboard with Aura Sync, 3x better battery life and a new Optimus mode that allows the GPU to be switched off manually to increase usage further when not gaming. 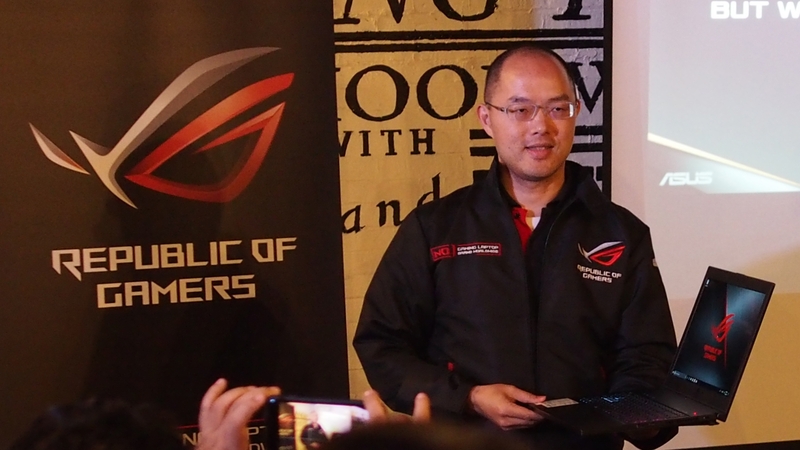 Featuring the ROG Exclusive Active Aerodynamic system, ROG infused Liquid crystal polymers to increase the fan size by 33%, airflow by 15% and the fan blades to 71. This is further boosted by the Hyper Cool design with Duo-Copper Thermal solution, 12 volt fan and Anti-Dust Thermal tunnels for maximum cooling efficiency. With this improved thermal design, the Zephyrus M is now able to fit in a full powered GTX1070P inside its ultra-thin chassis. The GL503 Series is as packed as ever! With New Intel Core i7-8850H Hexa-Core Processors, up to 32GB of Ram, 2TB of HDD and 512GB of PCIEx4 NVME SSD, paired with up to a GTX1070 – the GL503 is your best weapon to dominate the battlefield. The NEW Hero Edition now features 130% sRGB IPS display paired with 120Hz refresh rate while the NEW Scar Edition upgrades it’s response time to a 100% sRGB screen with super-fast 5ms response time for the most demanding FPS-Games. The GTX1060 and GTX1070 variants, on the other hand can be upgraded to a 144Hz screen so that gamers can maximize the power of their GPU. The Strix GL series also feature the new 12V fan with Anti-Dust Thermal tunnels for maximum cooling and efficiency paired with an upgraded version of the ROG Gaming Centre for the ultimate control. Gamers may now choose the NEW Silent Mode to keep the fans at minimum for sessions that don’t require intensive cooling. An exclusive Easy upgrade D-door is still available on all Strix GL series for future upgradeability to fulfill all the end user’s requirements. 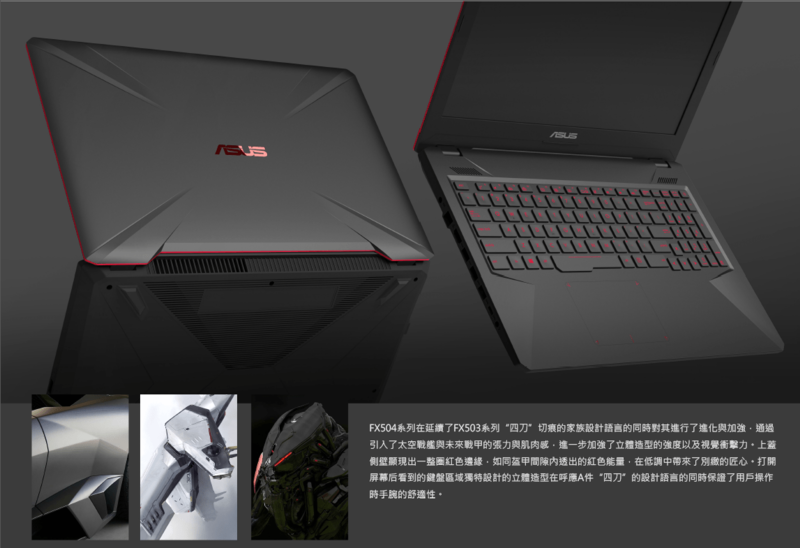 New in ASUS’ line of Gaming laptops is the ASUS TUF Gaming Series FX504 which takes the FX series to a whole new level of gaming. Featuring an all new design inspired by stealth crafts and sharp edges, the FX504 is an all-metal body with red accents around the frame to keep that signature gaming look. The FHD IPS display is mated to a 120 Hz IPS screen, now a standard in all ASUS ROG gaming laptops. Underneath, the exclusive ASUS V cut Design also ensures maximum airflow at the rear part of the chassis. Like the GL Strix Series, the FX504 TUF Gaming laptops also feature Anti-Dust Thermal tunnels and Dual 12 Volt fans to ensure all dust and dirt go through the tunnel and not remain inside the laptop, ensuring maximum life span and performance. The TUF FX504 also features the NEW Silent Model for gaming which can be controlled by a single hotkey to boost your fans or keep in silent when not needed. The reinforced keyboard is backed by a RED Backlight, an ergonomic design and an intense testing process to ensure 20 million key-presses throughout its lifetime. The TUF FX504 can be configured with an 8th generation Intel I5-8300H or Intel Core i7-8850H, paired with up to 32GB of Ram, 2TB of HDD or 512GB PCIEx4 NVME SSD, and Up to GTX1060 with 6GB DDR5.